Use the finder to find career tests are listed by format, prices, and interest area. 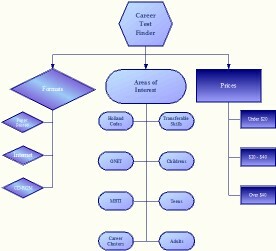 You can find career tests easily. Use our handy charts to find the right career test. Go to the career test finder interest web page. For an overview of all of the career assessments, go to the career test web page.